Franchises come in all shapes and sizes, from fast food through lawnmowing to spectacles. McDonalds, Subway and Specsavers are well-known examples. New Zealand has over 450 franchised brands, one of the largest per capita of any country. For some people, it’s a convenient way to become self-employed. When it was suggested I interview a recent winner of the Wespac New Zealand Franchisee of the year for Community Involvement, my response was less than enthusiastic. Well, said my correspondent, she’s an Otaki woman, and I think you might find her interesting. I approached the interview with caution…. The purchaser of a franchise will find themselves tied by rules that describe their product, what they should wear and how they should operate. They will pay a joining fee, and a royalty based on their success. There are some good franchises and quite a few bad ones. The subject of my interest was Sonia South, who has the master franchise for the sKids brand, which provides childcare services for primary school children. sKids stands for Safe Kids In Daily Supervision. There are 140 sKids franchises in NZ. Sonia’s first was at Raumati South in 2009 and now she operates six franchises in Levin, Otaki Paraparaumu and Raumati. Better than mowing lawns I thought. Unconvinced, I contacted the headmaster of a Raumati primary school to get a professional view of the service. “Looking after kids is a hard business to be in, just like working in a rest home” was the reply. Opening up, our headmaster enthused about Sonia’s business skills, her excellent people skills and how much he enjoys working with her. So I took a bit of notice. Good Samaritans don’t come much better, do they? This was the basis for Sonia South’s award from her professional body. So who’s Sonia South? Sonia grew up in Taranaki, did a double degree at Massey in Palmerston North in Psychology and Social Work, then did the normal OE thing. Or did she? Not quite. Travelling by yourself through Africa isn’t quite the same as swigging Fosters with a bunch of bogans in Earls Court. After Africa, Sonia worked in England, and with a Social Work qualification was able to see a bit of the country. Back in NZ she worked in New Plymouth for two years getting acquainted with Kiwi social work and Youth justice. Then she was head-hunted to work in Christchurch. Along the way Sonia met partner Nathan, of ngati Raukawa descent. Nathan was involved in Environmental Science at Te Wananga o Raukawa, and when their second child was 18 months old, Sonia got bored of being a stay at home mum. In 2009 she bought a sKids franchise in Raumati South. There are now 140 sKids franchises throughout NZ. Four years and another child later Sonia owns the master franchise for Kapiti-Horowhenua and now has 6 sKids operations.Is that the end? Not quite! Sonia’s target is to open programmes where there is a need for quality childcare in her local communities and a lack of services to support families. How does she do it? Easy really, if you have outstanding people skills and a good organisational brain. Child care means planning and organising. The sKids franchise provides the organisational structure and the methodology. All Sonia needs do is run the show, liaise with parents, schools, community groups, schedule everything and bring up a young family. Easy as. So how does the Otaki operation work? Based at Hadfield Hall in Te Rauparaha street, her Otaki operation has two support staff to help Sonia. They’re mums who have hands-on child support skills and a demonstrated affinity with children. Most support staff bring their children with them. They manage 18 primary school age children, who come from all over Otaki. Sonia has a van and will pick them up from as far away as the plateau or down the gorge. They start at 7am, and after school they go until 6pm. If parents can’t pick their children up by 6, they have to text, and kids can stay till 6.30 pm by arrangement without charge. What does it cost? Basically $4 per hour, which works out at $80 per week. Child Youth & Family offer a decent subsidies for families. A family with three dependents with an income of less than $1,540 / week would mean that the family only pays 40 cents per child per week, the state pays the other $79.60. The subsidy is under the OSCAR scheme (Out of School Care And Recreation Subsidy) In the school holidays sKids care runs from 7.30 in the morning until 6 at night, 5 days a week. This costs $200/week, with a ‘short day’ fee of $165 for 8.30 to 3.30, trip feesw are all inclusive in the price. 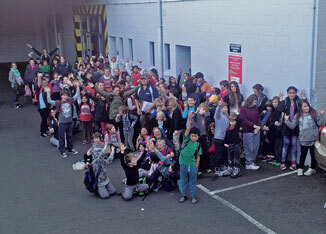 The Otaki operation had 29 children last holidays, more are welcome, Sonia says the more the merrier. Nothing seems a problem to this organised woman.